Proven in decades of rugged field use, there is no better snare pole than Ketch-All. With all the features you demand-lightweight aircraft aluminum shaft, swivel head, automatic locking mechanism, instant release, protective bite sleeve, non-slip rubber grips, vinyl-coated noose-plus a complete selection of lengths. Check our prices with any other source. This is the basic piece of equipment for any animal handler. For controlling the head; not for lifting. Note: the longer the pole, the larger the noose opening. Made from aircraft aluminum heavy-gauge tubing. 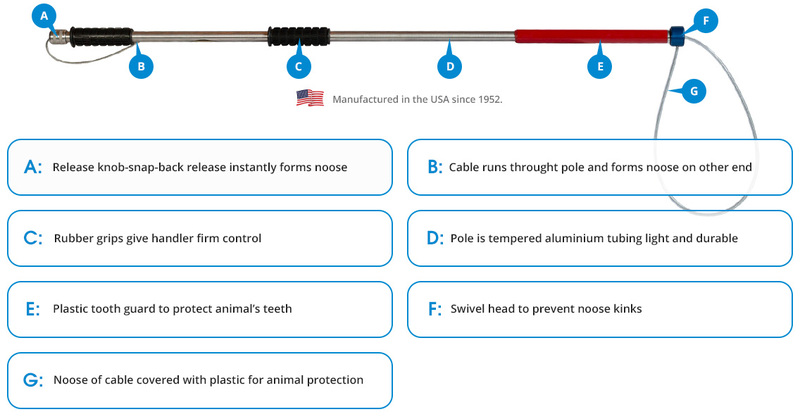 The animal control poles (Ketch-All poles) and other products are used by animal control agencies, humane societies, zoos, veterinarians, and other professionals, throughout the world. Do not suspend or lift heavy animals unless pole is retracted. When retracted, the extension pole is a heavy duty restraining device. Pull back on release knob to expand loop. Hold 1″ tubing next to chuck, turning chuck to right to free 7/8″ tubing. Push 7/8″ tubing forward until loop is closed. Turn chuck to left, thus keeping extension in place. Repeat above steps until desired length is attained. When in the process of extending the pole, watch for two red warning marks on inner tubing. For best results, do not extend past second mark. If poles should become separated, release locking device, and slide back together.